Melt into the woods with GHOST. Human scent is the most feared odor known to deer. Our product is designed to kill human odor at the molecular level on hunter’s clothing. Sprayed on inner garments, your clothing acts as a filter against body odors and provides day long odor protection. Areas to be covered are inside caps, around collar and armpits of shirts, socks, inside boots, back side of knee cap areas. It is also important to spray truck seats and equipment used while hunting such as fanny packs, back packs and tree stands. This product may be used in conjunction with other cover scents, such as Humus to give you all day protection against a deer’s best defense.… his nose. GHOST was also field-tested using blood hounds to see if they could trail the user, and we hate it for the dogs, but they lost the trail 10 out of 10 times! 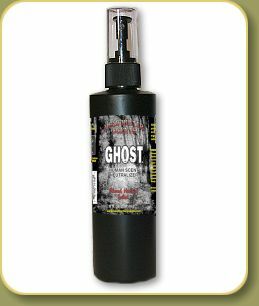 Available in 8oz spray and 32oz refills.